i actually had a different secret all ready to go for today, but then husband just expertly threaded a needle for the child. with a 6-strand embroidery thread. a task i momentarily thought him incapable of. because even after more than a decade, i sometimes forget how domesticated husband really is. he can thread a needle, load the dishwasher, cook a wonderful meal, paint the walls and ceilings (even especially the fiddly bits where the line has to be really straight), measure and hang pictures so they're perfectly straight, arrange the liquor cabinet artistically, hang wallpaper, comfort a sick child, doctor a wound, and carry a stuffed tiger all over dublin. these and many other things that are normally done by the woman of the house. oh, and he really is a viking. or at least goes sailing in a viking ship on a regular basis. he's in the red shirt and the rockin' gap hat kinda in the middle. he does tho', have worryingly girly taste in alcoholic beverages. 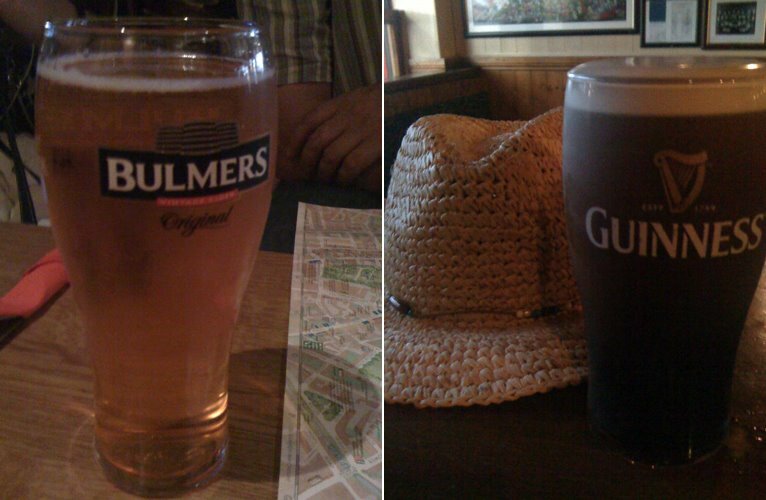 every time we ordered the guiness and the bulmers cider at our local pub in dublin (we went there three nights in a row, that makes it our local, right? ), they handed him the guiness and me the cider and it shoulda been the other way around. but best of all is husband's sense of humor, best expressed here, in the selection of axes he left out for us when i arrived home with the blog campers. in short, husband is a keeper. and is pretty much the reason that polly and seaside girl decided at blog camp that they wanted to start a new i need a danish man blog. girls, when are we going to get that up and running? So, I haven't read a single word of this - no not true. I read a sentence (you know I will be back when the house is still) but just had to pop over and tell you that you made a fabulous choice with this man who is now yours - how cute is he? The sander picture sealed the deal. Its a very sweet post. Did you show it to your hubby? 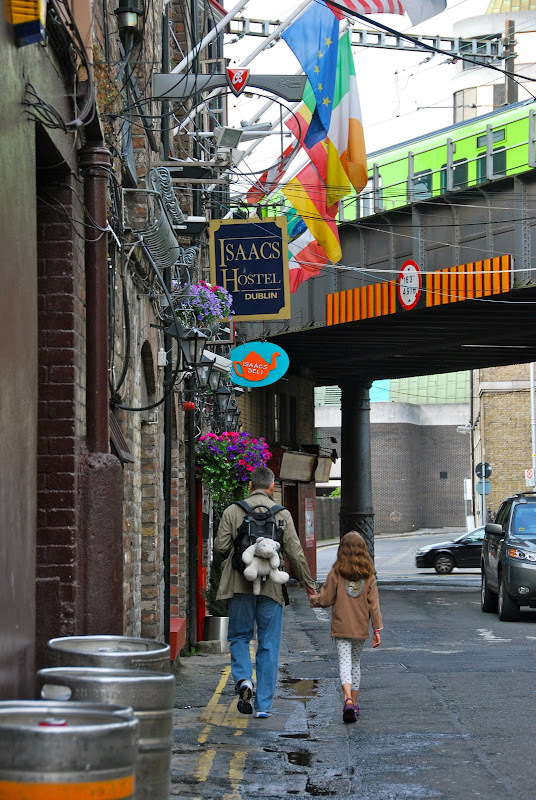 I love, love, love that picture of him and Sabin walking with the teddy strapped to his back. It made me cry, it is so sweet, you lucky girl! Was totally worth the trip to Macedonia, wasn't it?? Who cares if he is domestic...HE IS A GORGEOUS HUNK! HELLO!!!!!! I'm glad he is so domestic, but really, whip-t-do...just watch him and drool honey!!! Does he have a twin? Can he donate some samples of himself to the clone lab? Not for me.... for my sis! Lols. Wow! You are a lucky woman to have such a diverse and talented man in your life! Your husband is lucky to have you as you appreciate the things he does in a manner where most people don't notice what their significant others do! Kudos to you and your family! Not to brag or anything (you did start it), but my husband is similarly awesome. I can't imagine having one of those archetypal beer-swilling, game-watching men. I mean, my husband can do those things, too, but he does not engage with any frequency. In fact, the girls don't even ask me anymore to sew things for them. Any time something gets ripped, it's all "Daddy!" Awww look at you guys, so lovely...just like me and MrSpud although he is less practical. But v clever with 'puters so I let him off.